Strategic Source Components offers a wide variety of self-clinching fasteners for sheet metal. Self-clinching fasteners provide a cost effective permanent thread into thin sheet metal by using a parallel slow action press to allow the substrate material to cold flow into the knurls, serrations, undercuts, and/or hex configuration also know as the “self-clinching” features. In most cases, the self-clinching fastener must be 20 points HRB higher than the host material in order to achieve an optimal installation. It is also not recommended to use a quick action force, such as a hammer, as this does not allow the base material enough time to flow into the clinching features and will result in reduced or inadequate performance. 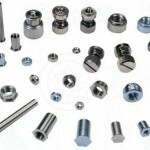 The advantages of self clinching fasteners are numerous. They provide for more thread engagement than trying to tap threads into thin sheet metal and often require less hardware (loose nuts, screws/bolts, lock washers/washers, etc). This can improve improve assembly times, improve strength/integrity (EMI shielding), and reduce the amount of components required to build a product. 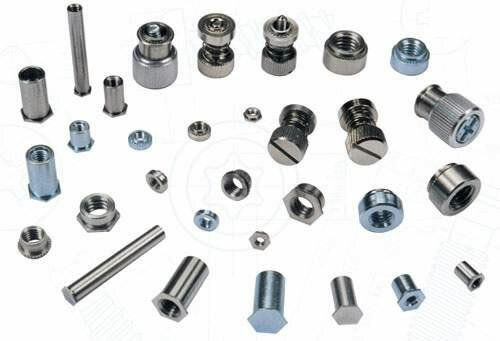 Some of the various self-clinching fasteners that are available thru Strategic Source Components are: nuts, studs, pins, standoffs, floating, and panel. Most of these products are available in a heat treated steel with plating, stainless steel, and aluminum.